The latest #AskMim request comes from Elaine, hello Elaine! 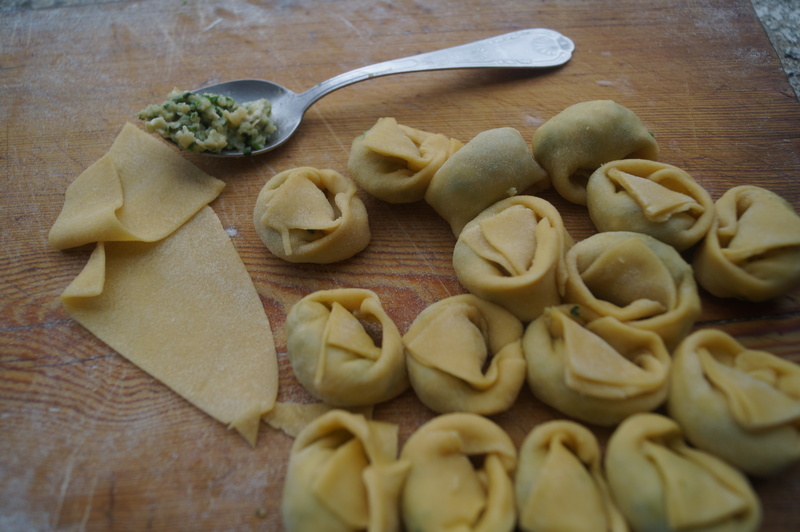 She wanted to know how to make fresh pasta and a good recipe for goat’s cheese & watercress tortellini…no problemo! Some of my favourite recipes are so neat, and once they’re in your head they stick there forever, always ready when you need them. Fresh pasta is just such a recipe, once you know the formula – it’s with you forever and you can play around with it all you like. 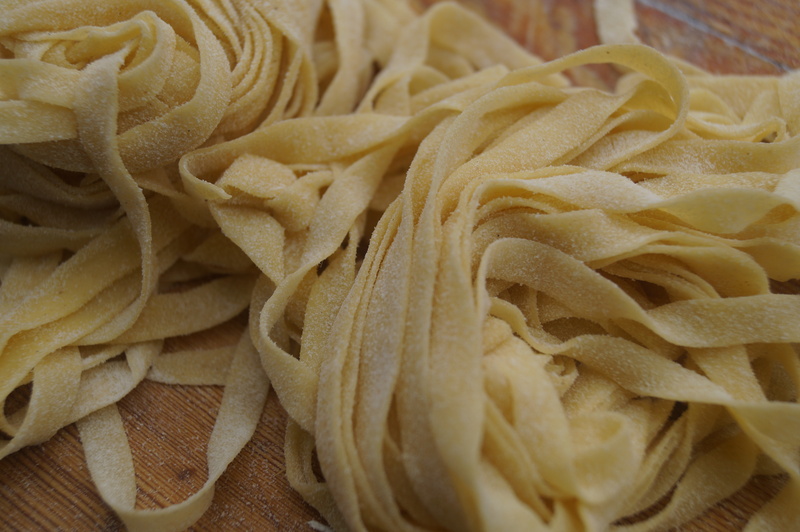 1 large egg + 100g pasta flour = 1 portion of fresh pasta. 1. Tip the flour into a large mixing bowl, make a well in the centre and add the egg. Using fork beat the egg into the flour then pop the fork down and get stuck in with your hands. Knead it really well for about 5 minutes until it’s smooth and elastic. 2. Wrap the ball of dough up in cling film and leave it in the fridge. It will keep happily in there for about half a day, any more than that and the dough tends to oxidise and you get a grey tinge to the outside which looks a bit dodge. 3. If you want to serve the pasta with something slow cooked like a rich tomato sauce or a ragu, now is the time to get cracking on that. 4. 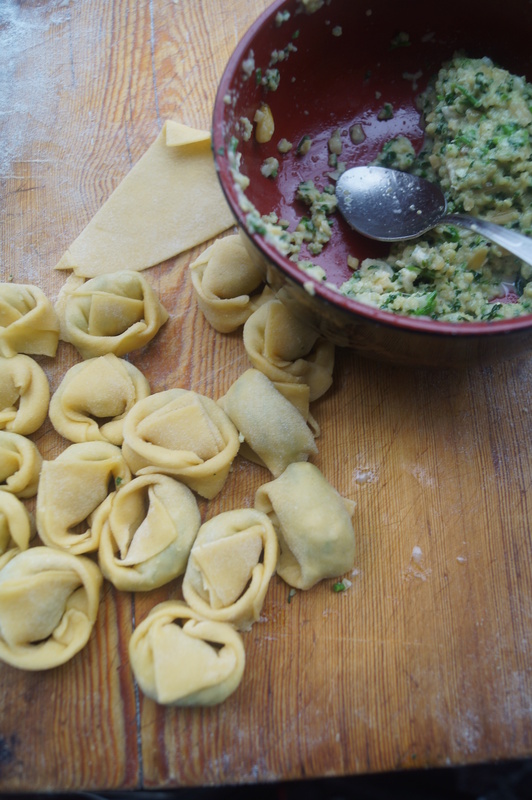 To shape the pasta, press it gently with your hands so it’s like a pitta bread and rub it with a dusting of flour. Set your pasta rollers to the thickest setting on the machine. 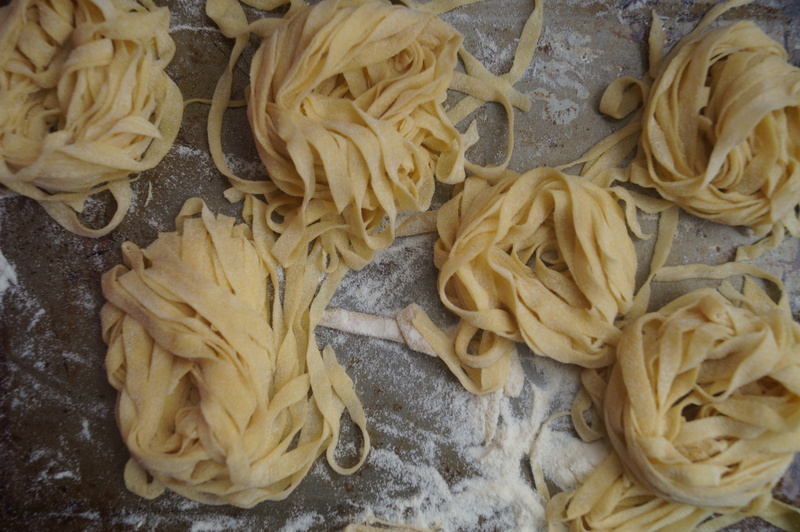 Run the pasta through twice, rub again with a little flour then switch it to the next setting down. Again run the dough through twice. Keep going, rolling and dusting with flour until you’ve been through all the settings, or until it’s the thickness you want. If you have one, add the cutting attachment for spaghetti or tagliatelle and run it through to cut it up. 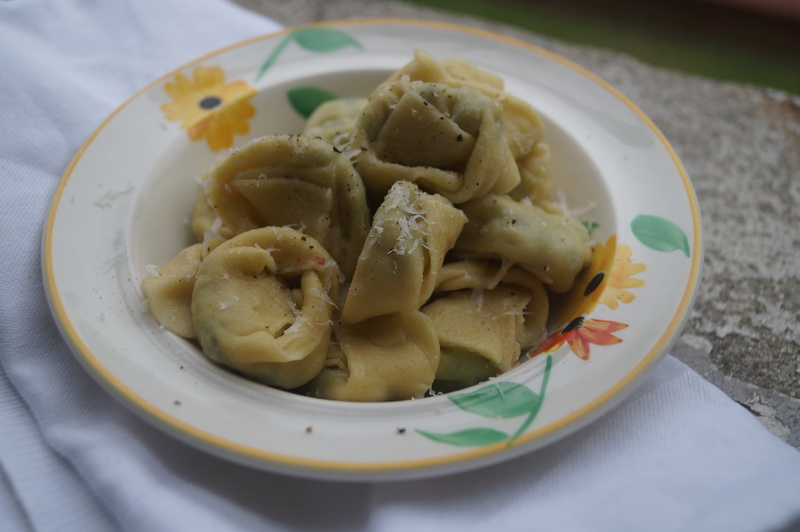 Alternatively, fold it into a concertina and slice it to get long ribbons of pappardelle or cut into squares with a knife, or circles with a cookie cutter, for tortellini and ravioli. If you don’t have a pasta machine, don’t fret. 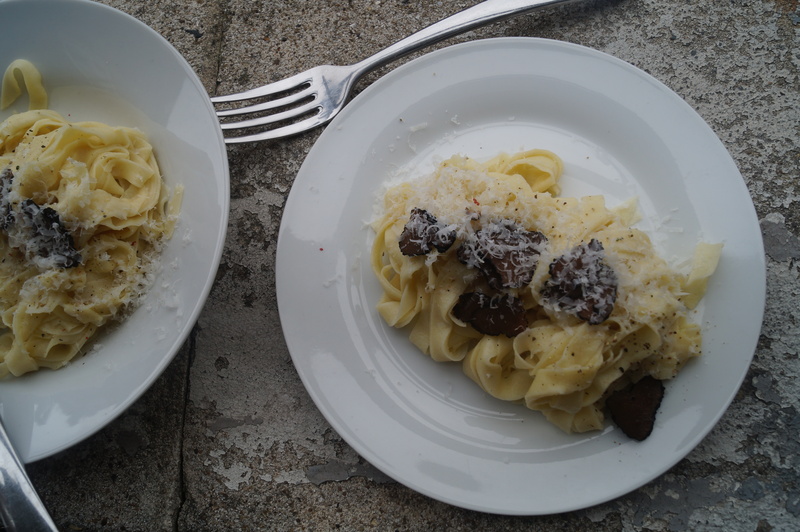 You can roll it out with a rolling pin (I usually do, I borrowed the pasta machine especially). Rolling it out by hand works fine, but it can be a bit heavy going, especially when you want to get it really thin. 5. 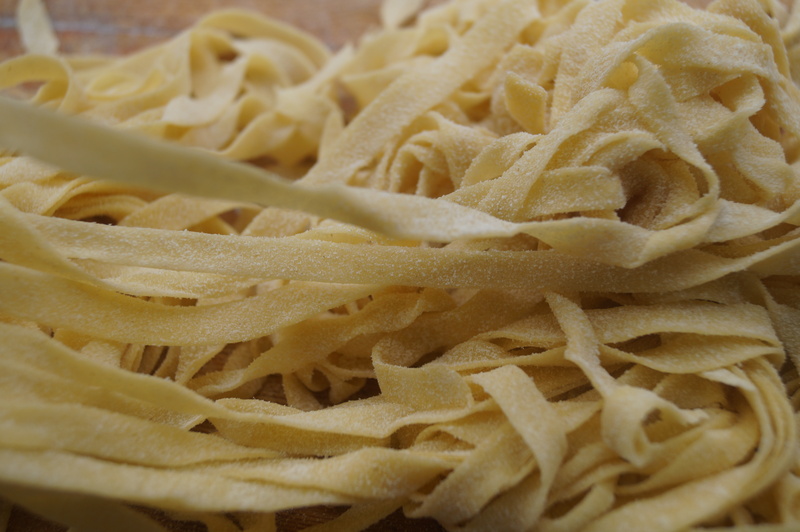 Pop some flour (or fine semolina) onto a work surface and toss the pasta ribbons in the flour so that they don’t clump together. 6. Bop it into a large pan of boiling water, (salted or fling in a glug of olive oil in there if you like) and cook for 4-5 mins or to your liking. Scoop the pasta out of the boiling water with a slotted spoon/pasta spoon, straight into a serving dish or into the pan with the sauce in. A splash of pasta water is good for thinning down a thick sauce that needs a little more movement. Serve straight away. 1. In a small saucepan mix all the ingredients together, then cook gently over a medium heat for about 5 minutes or until thickened, stirring all the time as if you were making scrambled eggs. Remove from the heat and allow to cool, then it’s ready to pop into the pasta. 2. Place 1/2 teaspoonfuls of the mixture into one corner of each pasta square. Fold the oposite corner over it to seal it in. You might want to use a little water or egg wash to seal it. 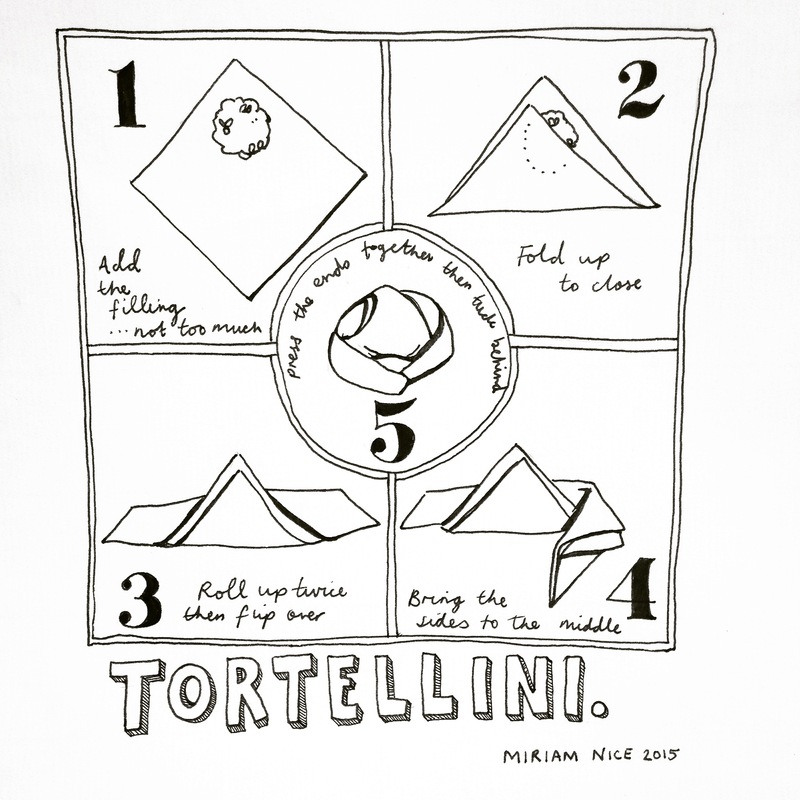 Push the air out carefully then roll the triangle up twice (like when you roll a neckerchief in the scouts/guides). Turn the parcel over and fold the ends to the middle then to the back, pressing gently but firmly to make sure it’s sealed well. 3. When you’ve repeated the process with all of the pasta and the filling, drop them carefully into boiling water for 3-4 minutes or until they’re starting to bob merrily on the surface. Scoop out with a slotted spoon. I like to serve mine very simply with a little more finely grated parmesan and some salt and pepper. If you would like me to write a recipe for you too or answer a burning kitchen conundrum please get in touch via facebook, instagram or twitter using the hashtag #askmim.